- Sigh. That feeling when you don't really want to go to the party, but there's no graceful way to get out of it. The one where you're going to have to smile and talk to people instead of curling up with a cat and a good book. You know that feeling, right? 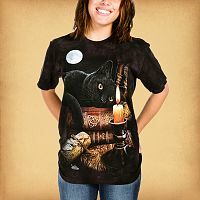 Well, if you can't escape an evening of socializing, at least you can find others with similar mindsets when they see you wearing this Witching Hour T-Shirt by Lisa Parker. 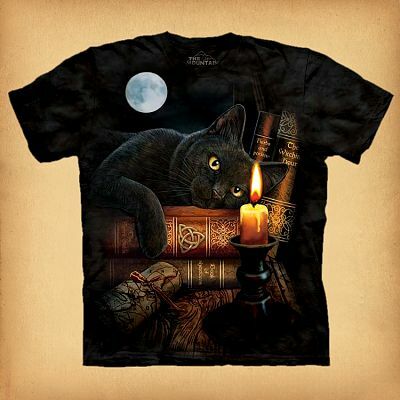 The Witching Hour T-Shirt is 100% cotton. It's hard to see in the picture, but the base color on each shirt is hand-dyed, giving each one subtle, unique background for the artwork. Then, the shirts are screen-printed with environmentally-friendly, water-based dyes. I love this artist! Do you have anything else by her? Do these shirts run large or small? These t-shirts are unisex, and are sized accordingly. If you aren't sure what size you need, we have a chart (below) that can help you decide. The shirts are pre-shrunk, and are true to size. I love The Witching Hour T-Shirt, but I need a 4X or 5X. How long will it take to special order it? We get new shipments from this manufacturer all the time, so it's really just a question of where we are in the ordering cycle. If we've just got in a large shipment of shirts, it could take up to a month. Typically, though, we can send special orders out to you within a couple of weeks. Do you have any other questions about our The Witching Hour T-Shirt? Just got my Witching Hour t-shirt just a few minutes ago. To put it mildly, I LOVE it! I love both t-shirts I've ordered from them. Good quality material and the designs are awesome!!! 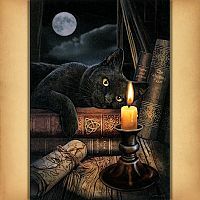 Gryphon's Moon has been my favorite online store! I Have this T-shirt & I love it. The art work is beautiful & clear. The cats eyes look like they are staring at you. He reminds me of my cat Raven. I highly recommend buying this T-shirt !